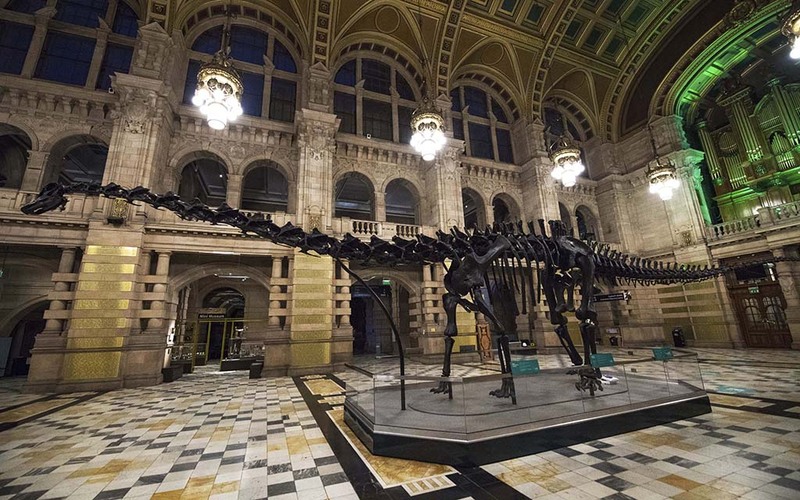 Dippy, the Natural History Museum in London’s famous diplodocus, is ready to meet Scottish visitors at Kelvingrove Art Gallery and Museum in Glasgow. The eagerly awaited Dippy on Tour: A Natural History Adventure opened this week and will run until 6 May 2019. Admission is free and you do not require a ticket to visit, although people are being asked to leave a little extra time to see Dippy, especially at weekends and during school holidays. After delighting over 130,000 people at Ulster Museum Belfast the splendid 292 bone structure, now replete as an impressive 21.3 meter long diplodocus cast, greets guests entering the Centre Hall at Kelvingrove Museum. Dippy’s visit to Glasgow is the only Scottish stop on an eight city UK wide tour. 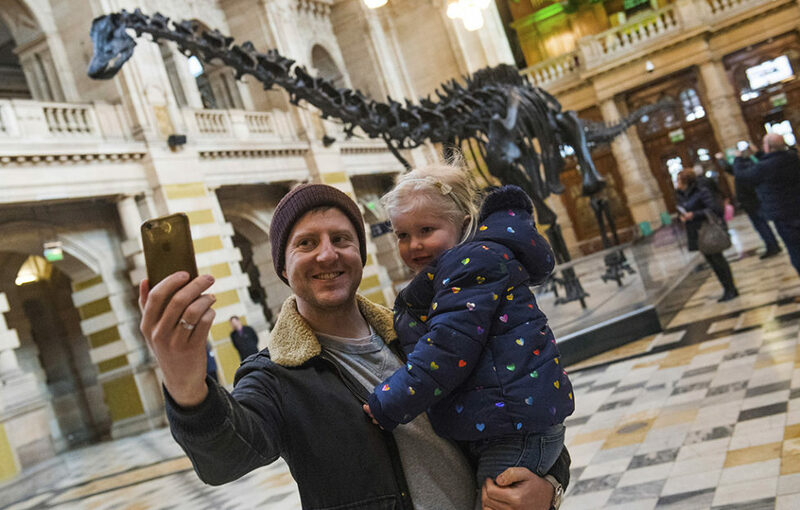 Dippy on Tour: A Natural History Adventure is being brought to Kelvingrove Museum and visitors across the UK by the Natural History Museum, London in partnership with the Garfield Weston Foundation, and supported by Dell EMC and Williams & Hill. 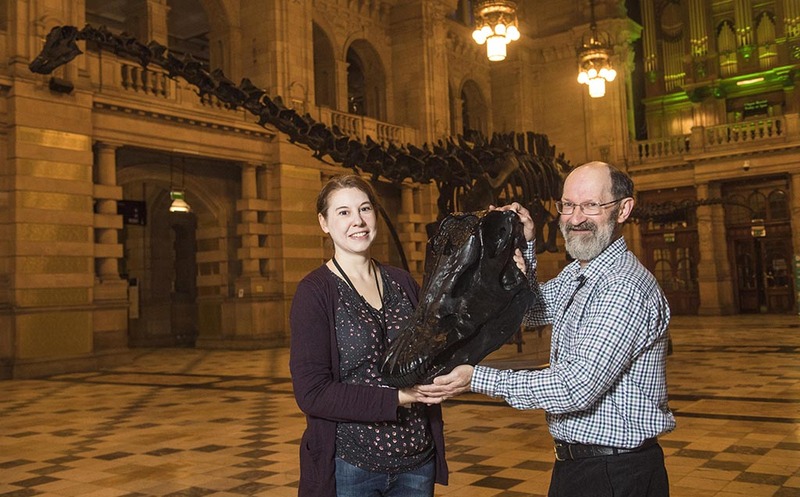 Director of the Natural History Museum, Sir Michael Dixon said: ‘We are thrilled that Dippy has once again made it safely across the Irish sea and has now arrived at Kelvingrove Museum in Glasgow. This marks the fourth stop of Dippy on Tour – a journey that has so far seen record visitor numbers at the three previous venues. The Natural History Museum’s Head of Conservation, Lorraine Cornish was joined by Emillie McQuade from Sunnyside Primary School Glasgow, who inserted the final toe bone into position just ahead of Dippy opening to the public. Emillie McQuade, a Sunnyside Ocean Defender, said: ‘To see Andrew Carnegie’s Dippy arrive on Scottish soil is amazing. 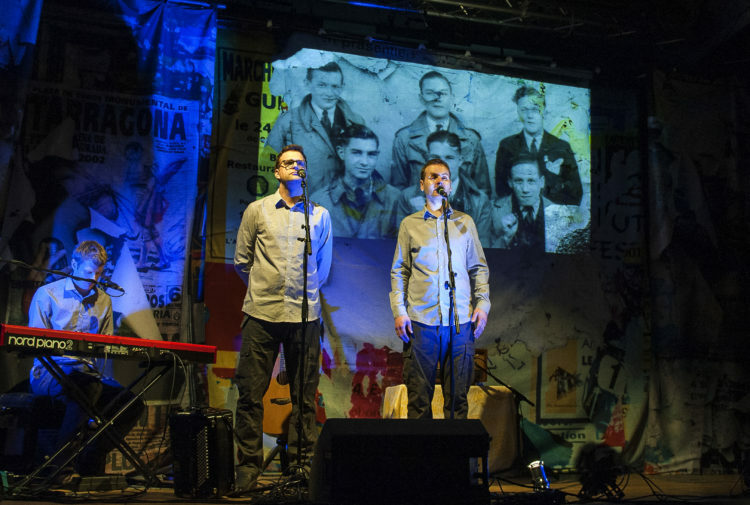 I’m sure he would approve of it being on show and inspiring Scottish children…of all ages! Diplodocus carnegii is named after Andrew Carnegie, the Scottish-American steel magnate and philanthropist who financed its excavation in Wyoming, USA in 1899. It was to become the centrepiece of The Carnegie Museum of Art in Pittsburgh. King Edward VII saw a sketch of the dinosaur while visiting Andrew Carnegie at his Scottish castle, Skibo and began a conversation that resulted in the commission of a replica cast. Dippy, as he became known, was unveiled at the Natural History Museum London in 1905, where he remained one of the most popular exhibits until preparations began for Dippy on Tour in 2017. 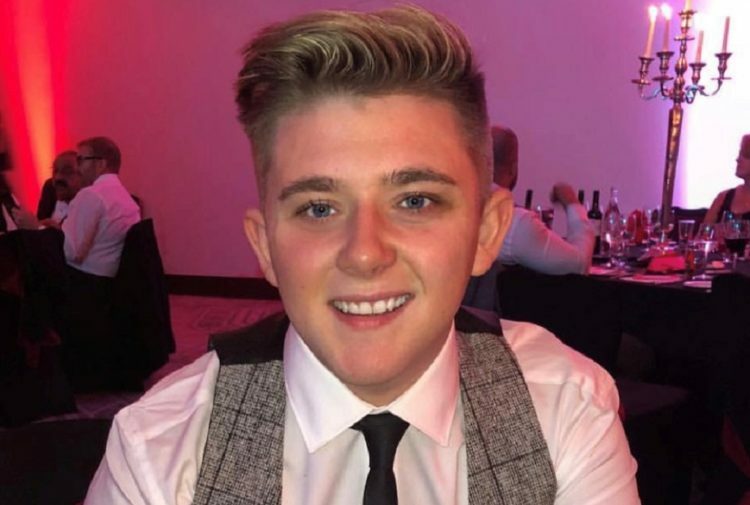 Chair of Glasgow Life, Councillor David McDonald, said: ‘Dippy has arrived. 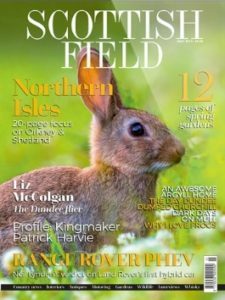 There is a wonderful sense of excitement surrounding the biggest thing to arrive at Kelvingrove Museum – quite literally – this year. 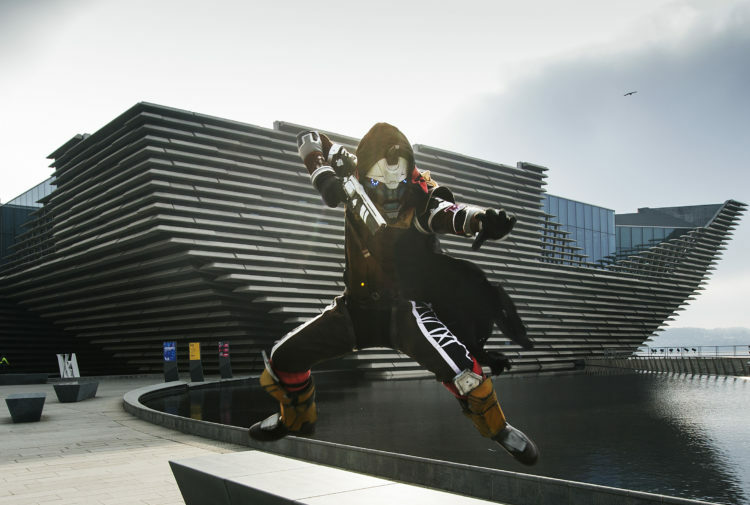 We’re delighted to be the only Scottish venue to host the iconic dinosaur. It feels a little like a homecoming given the conversations that lead to his creation started at Skibo Castle, home of Andrew Carnegie and it was a pleasure to have his great grandson with us for the opening. The Andrew Carnegie Birthplace Museum in Dunfermline has curated a small exhibition to complement Dippy on Tour, it shows a selection of objects from the museum’s collection, each related to the Diplodocus’s fascinating history. Visitors can learn more about why Andrew Carnegie decided to give plaster cast copies of Diplodocus carnegii not only to London, but to seven other countries around the globe between 1908 and 1913. William Thomson, Andrew Carnegie’s great grandson, was at Kelvingrove Museum for the opening, he said: ‘For Andrew Carnegie, Diplodocus carnegii was more than a huge prehistoric creature. It was a symbol and an opportunity. By gifting copies to the heads of state of seven other countries as well as the UK, Carnegie hoped to demonstrate through mutual interest in scientific discoveries that nations have more in common than what separates them. For further information on Dippy on Tour and associated events, visit www.glasgowmuseums.com.